Fun & exciting opportunity awaits those interested in donating their time and talent to the Tibbits. Our volunteers range from 8 to 98. They include students, retired persons, stay-at-home parents, and people employed in occupations as diverse as the volunteers themselves. There are many fields of interest that require a small army of volunteers to help keep the Tibbits running efficiently. This dedicated group is organized and managed through the Tibbits Boosters Organization. Have you ever thought about volunteering your time or talents at Tibbits? Volunteers are our most valuable asset. Tibbits Boosters is an organization of Tibbits supporters who have volunteered more than 5 hours and are at least 18 years old. Volunteers are needed in numerous areas – ushers, office, auction, special events, art, behind the scenes, and youth programs – to name a few. You can volunteer as often as you like and in as many areas as you like. The choice is yours. Over 250 people donated their time and talents to the theatre last year. The Booster Organization recently completed strategic planning. Its mission: to provide and coordinate volunteer support for Tibbits. Its reorganization: to focus on recruiting, retaining and recognizing. The Booster leadership has chosen to move to a streamlined, committee structure instead of a governing board. The committees directly reflect the primary needs of the Tibbits Opera Foundation. Learn about the new committees & volunteer opportunities HERE. Interested in Volunteering? Contact Amy at specialevents@Tibbits.org for a volunteer interest form and interview. If membership is the foundation of the theatre, then the Boosters are its heart. Over 250 people donated their time and talents to the theatre last year, and we cannot thank you enough! As noted in the October newsletter, the Boosters recently completed strategic planning. Its mission: to provide and coordinate volunteer support for Tibbits. Its reorganization: to focus on recruiting, retaining and recognizing. The Booster leadership has chosen to move to a streamlined, committee structure instead of a governing board, but most of the volunteers won’t notice a difference. The committees directly reflect the primary needs of the Tibbits Opera Foundation. We are currently undergoing a website update, so our online forms are unavailable. Submit your volunteer hours by emailing Amy HERE. Each year in March, volunteers are nominated as volunteer of the year. It is a surprise announced at the Volunteer Reception held each spring. If you would like to nominate a volunteer of the year, please send your nomination to Amy HERE. Please include who you are nominating and why you feel they deserve the award. 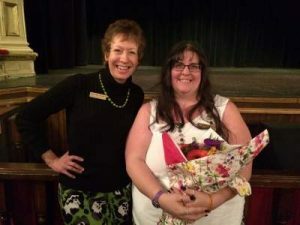 The person volunteers at TIBBITS. The number of hours worked is not as important as a willingness to “do-what-it-takes-to-get-the-job-done attitude” with a smile on their face! A Booster Newsletter is provided via email. Volunteers are thanked, new opportunities to volunteer are explained, and Tibbits information is shared. After the restructuring of the Booster Organization, we are moving to a quarterly newsletter but will still continue with monthly email updates. 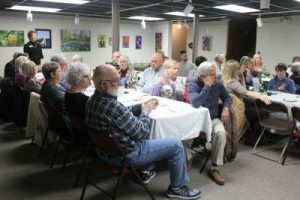 A Volunteer Reception is held each spring. All volunteers are invited, pins are awarded at this time, and the Volunteer of the Year is honored. Refreshments and entertainment are provided. The date of this year’s spring volunteer reception is TBA. Once the date is posted and invitations go out, please RSVP to Amy at 278.6029 or specialevents@Tibbits.org.